One thing that I learned from this game is my generation is no longer entitled to the ultimate opinion on what is right about the Star Wars franchise, and what’s not. The three decades-long story Lucas made up raised several generations. The youngsters began their acquaintance with the franchise with the Lego Star Wars and Star Wars Rebels cartoons. Not the sequels. 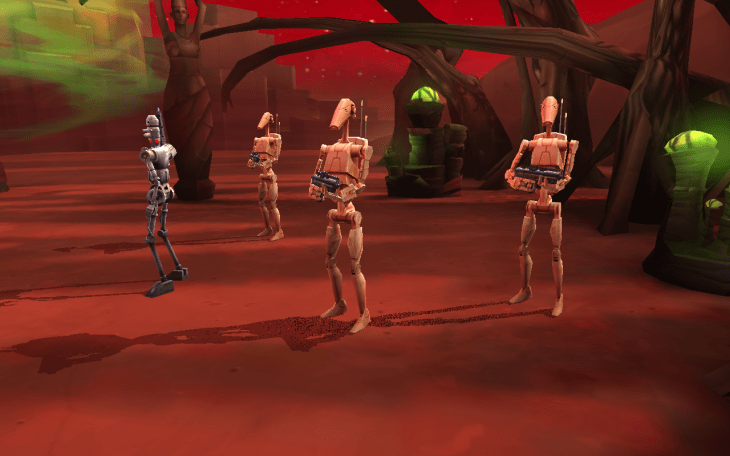 Then, there are a bit older fans who haven’t played the SW video games and appreciate every Star Wars related content. 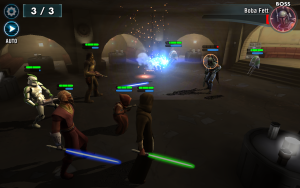 There are also the console veterans, who look down on mobile and dismiss freemium. There must be quite a few intermediary types of Star Wars fans, but you get the general idea – the difference is in the total amount of SW content consumed per lifetime. 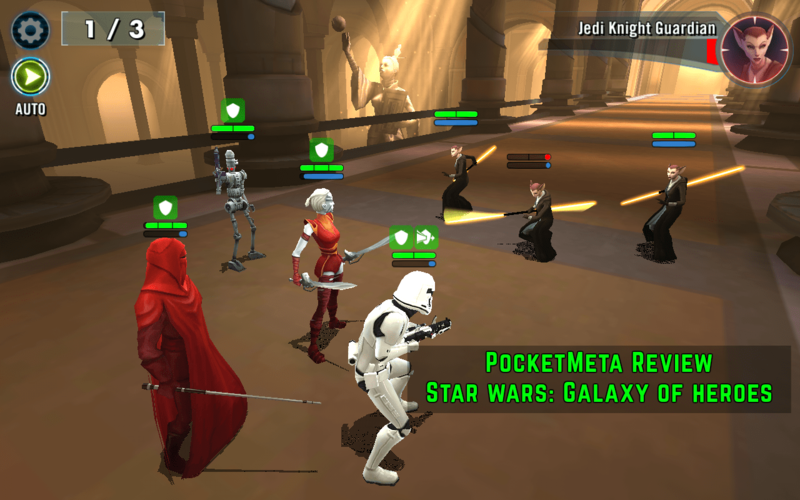 The point is, Star Wars Galaxy of Heroes gave birth to more than just another horrible acronym (SWGoH, OMG). It divided the fandom into those who say it’s the best mobile game this year, and those who call it “not a game” with some in between. Which is it to you then? Take a card battler, strip the cards, add the fancy and well-rendered animated characters, add a fairly fun RPG element with leveling up, shards, gear and team (aka deck) building, spice it with a few ways players can battle versus the AI and one another, form alliances – and voilà! Of course, there is more to it. The primary reason why anyone would want to check it out is the 90 collectible characters (like cards, only animated). The characters come from pretty much all the movies, with the famous and the rare ones mixed in a hot soup of human preferences. 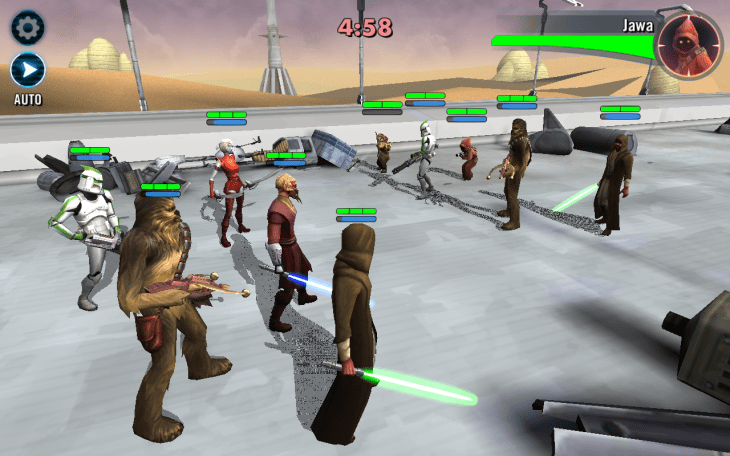 This time around, you get to play with the Jedi and the much craved light-sabers. 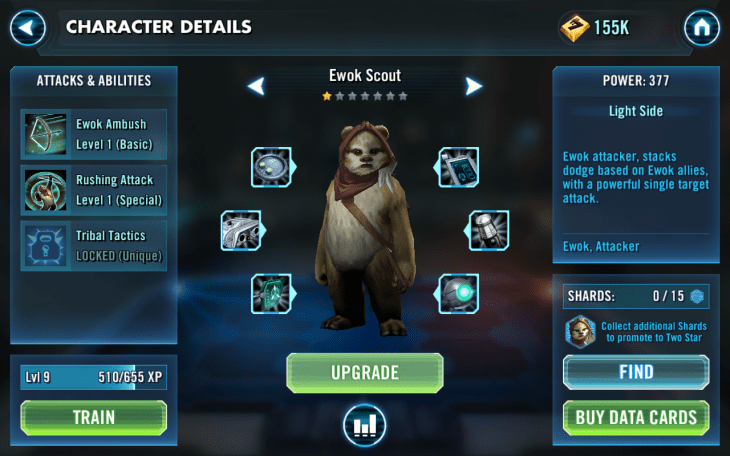 However, do not hope to get Luke or Leia early in the game. By the time you will be neck deep in the game, you will realize how the sweetest cards are hard to come by and require tiresome grinding or real cash. 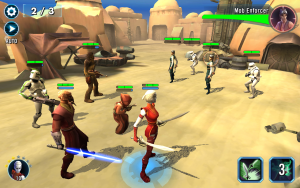 Yes, it’s freemium at its “finest.” Yet, there is some fun to be had here without paying, provided you don’t seek depth, but a time killer set in SW iconic locations. You get a couple of resistance characters and start battling the early levels of the light side. 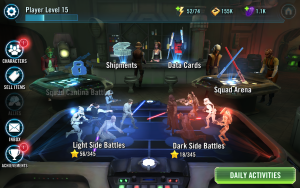 As you reach level 10, you unlock the dark side, and by then you should have accumulated enough imperial characters to start progressing through the dark side levels. Each side has 345 levels packed in chapters; each level can be played in Normal and Hard modes. First, you need to complete a chapter in the normal mode, then you can replay the same levels in the hard mode. The reason to do so is the loot. As you level up, you unlock the Challenges (same battles but with rare loot), the PvP Arena battles, alliances, Cantina battles and a few more perks. The overall structure of the game is quite jam-packed. The game rewards you for logins, completing missions, buying crates, earning achievements and even collecting rewards. The loot comes from every battle you play, as well as from data cards, rewards and achievements. Don’t forget to log in daily to get your free loot. Alongside the in-game currencies and sim tickets, the loot brings gear, shards and training drones. Shards are basically like blueprints in Need for Speed No Limits. 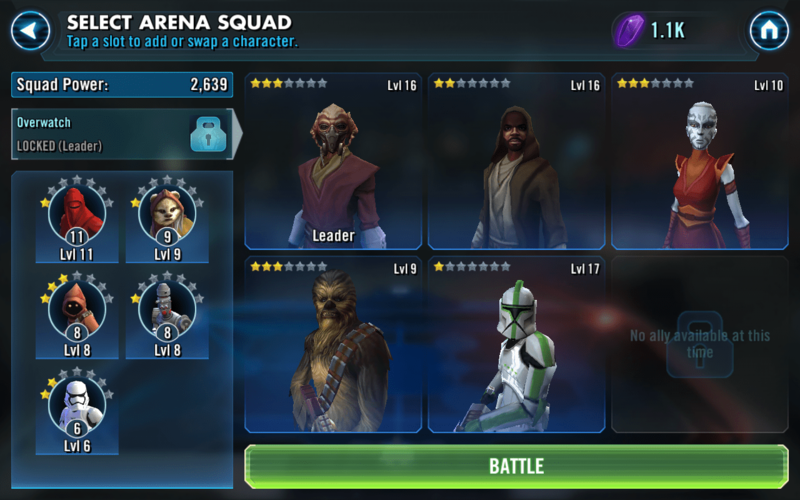 Collecting shards for a specific character will eventually unlock that character. Collecting more shards for an unlocked character will let you level it up to gain more stars. Characters come from crates aka Data Cards. You get a free Bronze one every 15 minutes or so, but besides the characters these cards bring gear and in-game currency, so there is no guarantee you will be getting a character each time you draw a card. The reward is random, so even if you pay for it, you never know what you get. Also, characters come from shards – collect them from the missions, and eventually you will unlock new characters. Overall, however, by the time you reach level 15, you will have slowed down in unlocking new characters and have gotten the idea where the paywall is hidden. From there, it’s pay or grind. Each character has a class reflected in its stars, and a whole load of stats. The important basics is the Training and Gearing up. 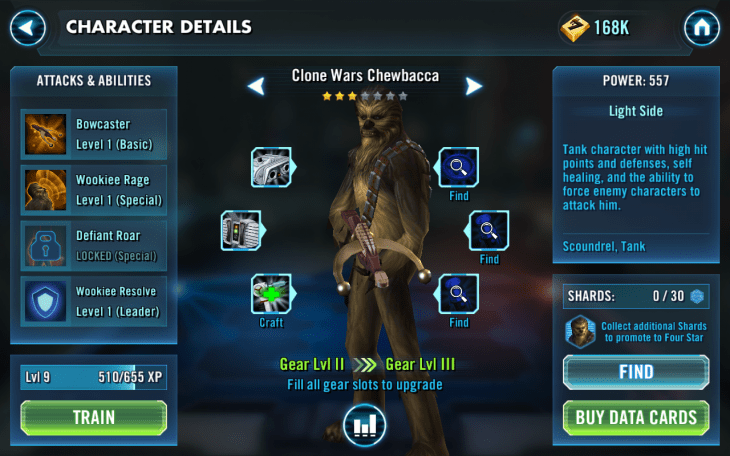 Each character has a set of some six gear slots – fill them all in, and you can Upgrade a character. This effectively removes the current gear, but lets you equip higher-tier gear and craft it, too. To train a character, you need training drones that drop with loot and in the Data Cards. Drones, too, come with stars, and you can assign them to any character that you like to train. 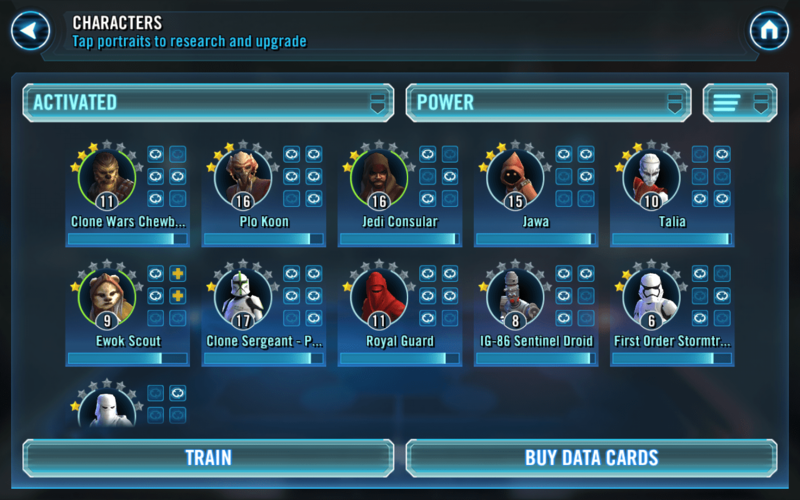 50% of your time you will be busy training and upgrading your characters. 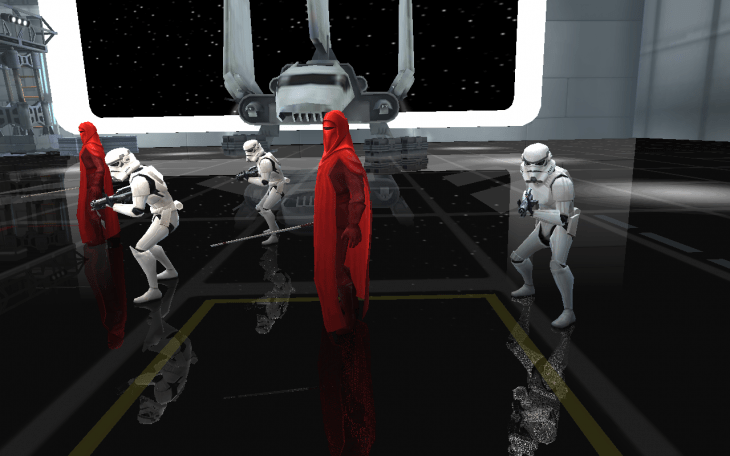 As for the characters, the variety is pleasing, and they are rather well-dressed, animated and rendered in 3D, with sound effects and some combat animations, too. 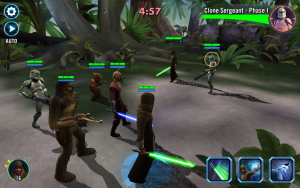 When my Dark side team went out against the Ewok scouts, my nephew screamed “You’re killing the bears!” – the only time I laughed when playing. The (lack of) jokes in a game needs to be a special rating criterion. 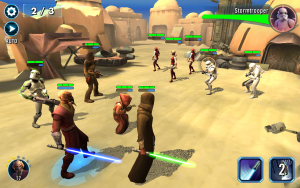 The battles are pure CCG-style. Yours are aligned against the rival’s and you activate their abilities and special abilities on a per-turn basis. You can’t change their locations nor can you switch to and from the characters; you can change the target, though. Alternatively, you can switch to automatic mode and let the AI stage the battle. The characters will perform a few stunts, but will remain static most of the time, bending to side as they get low on health. The overall amount of eye candy is pleasing, I just wish for a more substantial gameplay. The music in the background and the character exclamation loops sound very SW-ish or SW-esque. Overall, the artwork deserves a praise. Samsung users will be able to get a freebie courtesy of Samsung. There is also a free Bronze card every once in a while. Then, there is a plethora of in-game currencies, the energy, the sim tickets, the special arena thingies, the gems – forgive me if I missed something, but it’s quite overwhelming. The one useful and hard to come by currency is the sim tickets, which allow you to simulate re-plays of the level you already cleared with 3 stars just to squeeze more loot out of them. Provided you will need to do that often to level up your characters, sim tickets are a valuable asset. You can buy pretty much everything in this game except for an option that removes IAPs, or energy system. As you’d expect, IAPs come in packs, bundles, limited-time offers and are expensive. Hollywood had a year of bad movies followed by lousy movie tie-ins on mobile. James Bond made me weep; that’s why I am happy we did not get another Mockingjay CCG that’d sour the bad aftertaste the movie left. 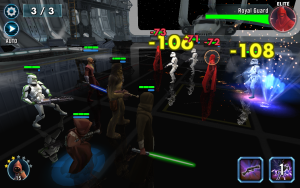 Star Wars The Force Awakens launches on December, 18, and SWGoH is meant to remind us of it now that the Uprising buzz reduced. 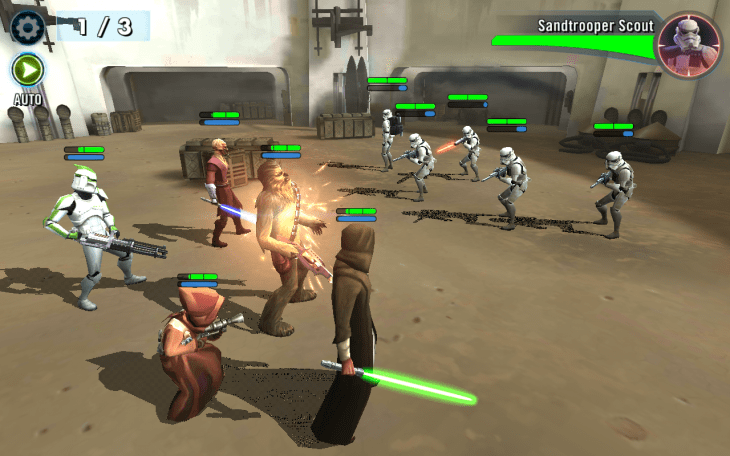 It appeals to the younger audience not looking for much depth in their games. The amount of micro-management suggests a shallow gameplay, but even so, there is so much to do here you will not be bored for the next couple of days until you hit the grind or pay wall. I wish I could say this is a perfect time killer, but it needs connection to run and is a major battery drainer. 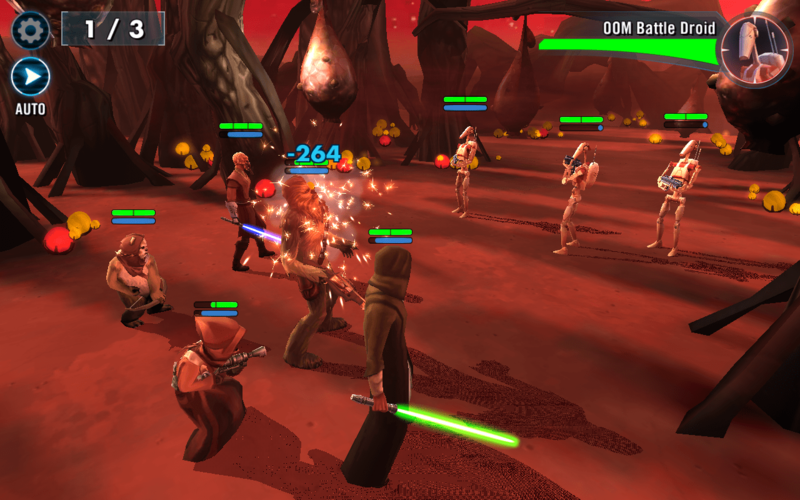 PvP and alliance is fun, collecting characters is fun, but battling is so-so, with a modest amount of strategy. The grinding is boring because when the novelty wears off, the difficulty of reaching those rare characters becomes obvious. It’s a nice, fairly addicting game. 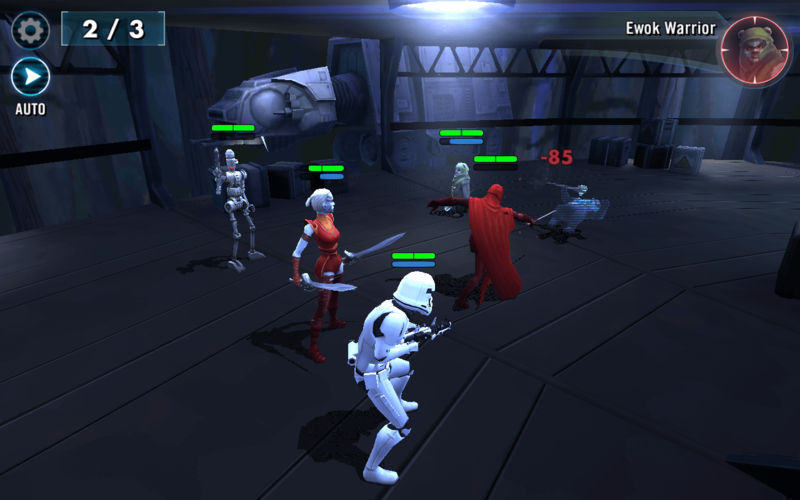 Star Wars Galaxy of Heroes is a nice, fairly addicting and good-looking time killer. Try it.